Updated for Mac Maverick(v10.9.5 v10.9.3), Version 6.1 (6A1052d) XCode6 Beta3, iOS 8.1 7.1, and the latest Linphone source (as of 01/17/15 7/29/14 ). Tested deploying to iPhone5, iPhone5s, iPhone6, and iPhone6 Plus simulators. Note that you may need to add the path to port to your shell’s path. MacPort’s executable, port, is installed to /opt/local/bin. See this page for more instruction. The build can take a long while, so grab yourself a good book or go make yourself a good cup of instant noodle. Select the linphone project, then click the “Build Settings” link. The default architectures should include armv7 and arm64. Change Architectures and Valid Architectures to remove arm64. Leave armv7 and armv7s. After the architecture change, try compiling against iPhone5s, iPhone6, and iPhone6 Plus simulators. Note: This tutorial only works up to iOS 6.0. Solution: You may have multiple simulators. Close all of them and try again. Also, I ran into this problem when I have both XCode5 and XCode6 Beta 3 open, including their simulators. Any suggestion how I can fix it? I can’t run on simulator? how to rid of this error? It seems that you are missing msilbc (the msiIBC plugin developed by linphone.org) , hence the libmsilbc.a missing error. I would suggest downloading linphone-iphone project again. plz help me , i run make all command in build directory . Thanks for your kindness to share these information on internet. Could you please guide me to figure out what’s the problem ? I had already resolve my issues. Now I can build and modify the linphone-iphone on my Lion with XCode 4.1. Hi.I get the latest linphone-iphone version,follow the Readme,when “make all”,get two error,it seems that “GNU assembler not found, install gas-preprocessor”. Did you use the latest version? And are you successful? I have compiled the linphone libraries and successfully compiled the project for iPhone simulator 5.0 also. But when I try to compile for iPad simulator 5.0 its not working. Its compiling successfully but getting paused in between with blank screen. Says “Program received signal “EXC_ARITHMETIC”. And when I try to put on iPad 2 device it gives some compilation error..
Any insight to this issue? hi! I get linphone-iphone source from git://git.linphone.org/linphone-iphone.git today. compile and run perfectly on April 03 2012 fresh download linphone and macport. using Lion. today (April 27) fail to compile a fresh copy from linphone git. Libtool : Version mismatch error. This is libtool 2.4.2 but the definition of this LT_INT comes from an older release. You should recreate aclocal.m4 with macros from libtool 2.4.2 and run autoconf again. Its a very helpful tutorial you gave through it. I allow Macport and followed everything from terminal but failure to run app on device nor on Simulator. I am totally exhausted in rectifying solution for 3 days but failure to do so, please help me as your help will be highly appreciated. I have MAC version 10.9, XCode version 5.1.1. Can you tell the steps to follow to integrate Linphone in my iOS project. Hmm, I am not quite sure of your question..
can you please tell me this error after successfull build. finally i delete app and disable poxy. Now i unload app its working fine. My apology for not getting back to you soon enough. Just got back from vacation. Glad to hear that it’s working out for you now. Did you disable the network proxy? Hi i’m trying to compile linphone-iphone module on Mac Mountain Lion. Xcode version 4.5. I followed the steps given in this page. I successfully crossed upto step4. In Step5, I executed the command “make -f builder-iphone-simulator.mk all && make -f builder-iphone-os.mk all &&make -f builder-iphone-os.mk delivery-sdk”. While making the linphone sdk. Any idea whats wrong here. well.I also face this issue while building the sdk, please give some more details to solve this build error,Thanks a lot !ex: which file to modiy, and how to modify ,thanks! a blog however I do write in my diary everyday. I’d like to start a blog so I can easily share my own experience and feelings online. Please let me know if you have any kind of recommendations or tips for new aspiring bloggers. Appreciate it! Surprisingly, it’s not as hard as it may seem to start a website like this. This site is powered by WordPress and WordPress is pretty easy to use. To start, you would find a hosting company that supports WordPress. Check out this link: http://wordpress.org/hosting/ for the recommended hosting company. I use DreamHost and pay about $9/month for hosting. Or if you want something simpler and free, Google Blogger (http://www.blogger.com) is pretty nice choice. Now go blogging! I am using xcode 4.6 ios sdk 6.1 and Mac OS Lion. Hi Nitin,I met the same problem,and my xcode,MAC OS is the same as you. My device is iPhone4,what about yours? I hava solved this problem. 3 warnings and 3 errors generated. this website could undeniably be one of the greatest in its field. Can you help me with my problem, I often get this error below.. I have tried few times redownloading from the GIT but still giving me the same error..
Hi,seecah! I am confused with the problem the same as yours. I think you must have solved it. Wish for your help,thx! hi , i`m a coder, can you give me a demo about linphone. thanks. Thanks for such a wonderful post. i have followed all the steps mentioned above. rsync -rvLpgoc –exclude “.git” /LiniPhone/submodules/build/..//externals/polarssl/ . 1)check xcode and mac os x versions. 3)install mac ports use above doc. hi, i downloaded iphone src from linphone. but i cant able to debug thr src. it showing error. the files inside the include folfers are in red color.and showing file not found. plz help me. sent me one working code. Please paste the error message and specific the XCode, iOS, and Mac OS version you are using. i stuck in this command. Resolving \342\200\223no-check-certificate… failed: nodename nor servname provided, or not known. Connecting to raw.github.com (raw.github.com)|103.245.222.133|:443… connected. ERROR: The certificate of ‘raw.github.com’ is not trusted. ERROR: The certificate of ‘raw.github.com’ hasn’t got a known issuer. Thanks Admin, but now my problem is the file inside the include folder is showing redcolor, it means it is missing. plz help me. When i build and run linphone.xcodeproj it have a erro: file linphone-banner.png : no such find and directory. Did you try typing that command “file linphone-banner.png” at the command-line? Either linkphone-banner.png can not be found or “file” command is not in your path. #Force install script to use -C so that header files don’t get re-written if not changed. Hello im am getting this error can you please help I’m new to xCode and cannot figure out what is wrong. You have replied to another person asking for the same problem. Please help me out. At a wild guess, I suggest, re-cloning “polarssl” using its git access to its registered directory which is /submodules/polarssl/ ! And then, go to polarssl’s subdirectory ( /submodules/externals/polarssl -> This one’s correct, I made a mistyping in previous comment ) configure the source ( execute ./configure ) and then make it ( make all ) ! make: *** No rule to make target `/Users/Unkn0wn/Developer/GIT/linphone-iphone/submodules/build/..//externals/polarssl/Makefile’, needed by `update-tree’. Stop. Would you please help me with some solutions ? I have no idea what that “needed by update-tree” means ! I just found the problem and solved it ! but I get the same error, as described in “gold711″‘s comment, above. Any idea on that problem ? It’s been pretty busy at work so I have not checked the comments on this thread recently. I will try to recompile LinPhone again on my mac and see if I can reproduce the same error as gold711. Regarding that first problem, I figured out that my connection had been interrupted while I was cloning the source using GIT access. Re-fetching everything solved the problem. rsync -rvLpgoc –exclude “.git” /Users/Unkn0wn/Developer/GIT/linphone-iphone/submodules/build/..//externals/polarssl/ . Well , I have tried a few things, and I solved this error myself, by going into polarssl registered directory ( /submodules/externals/polarssl/ ) , configuring ( “./configure” command ) and then making ( “make all” command ) the module. make: `libsrtp.a’ is up to date. Any idea how to solve this ? Okay, I solved that and 5 more problems that occurred one after another next to this one ! Still not being compiled !!! I officially gave up and used “Siphon” for iOS. It was way easier to compile that and it works like a charm. I really suggest everyone who wants to use linphone to switch to Siphon. I finally managed to build linphone on iOS, which should be easy using this tutorial and “A FULL VERSION OF LINPHONE SDK FETCHED OVER AN L2TP VPN CONNECTION” which took me 3 weeks to find out about! I just tried do build the sdk following the tutorial above. The make have finished, but with a lot of errors. At the end i couldn’t build the linphone.xcodeproj sucefully. I didn quite understand have you found a place where to get a A FULL VERSION OF LINPHONE SDK? I fetched a FULL VERSION of Linphone SDK from the git link inside Linphone’s website. The problem is that the connection interrupts a lot and I really recommend you to use a secure L2TP VPN connection to fetch it. I tried like a hundred times to fetch a complete version, which by the way has a size of 508.1 MegaBytes ( iOS version ). After a long time I was able to clone the repository but now the error is in libtool as below, I have libtool installed..
You must have libtool installed to compile libxml. Which link gives you file not found? this might be a foolish question but can anyone show me how to download Linphone with g729 for my iphone 4S? (not jailbroken). Or is there a free version of anyother softphone available with g729 that you know of? How could possibly be so difficult to compile something? I am resolving issue after issue, the last one was mediastreamer2 configure file syntax error, opened the file with sublime text, removed a space, saved and then different error: make: *** [build-linphone] Error 2 with no other indication. Really? You did follow step 6 to update the SDK version, right? I ran into many problems similar to your and was able to resolve it with the correct SDK version. why?? please help….thanks very much! Thanks for the article, most helpful. It appears you need to sudo port install nasm to solve. Thanks Chris! Post updated to add nasm. i just followed your steps and its pretty worked for me… thanks for your steps. Please help me on it.. The byte alignment warnings are due to the changes from 32 to 64 bit datatypes. When C type structures are created the developer can change the order of the variables according to their data types size so that the underlying memory map becomes 4-byte aligned. Take a look at https://developer.apple.com/library/ios/documentation/General/Conceptual/CocoaTouch64BitGuide/Major64-BitChanges/Major64-BitChanges.html or http://www.bignerdranch.com/blog/64-bit-smorgasbord/ for a proper explanation. In my case I have built the library for a minimum of iOS6 on armv7, 7s and simulator without any major problems, but I don’t have an iOS6 device to test against (only 7 & 8). with a quick heads up! Aside from that, excellent website! Hey thanks! Just check with IE 8 and it looks fine. Would you be so kind to provide me your IE version and the page you are seeing the overlapping on? Thanks So Much Jess! Super usefull!! Good to see there are more technologist informatics women out there. Jessica First Thank You for this post!!! Also has anyone worked with the SDK I’m looking to you this in my app but there are NO examples out there…..
3G .. Anyways, excellent site! I’m new to iOS Development but I know C#, Python and Java. I’m looking to integrate Linphone into IOS project via Swift programming language. I build and ran the hello-world with no errors but nothing came up in the simulator. What is the best way to start my project, I’ve created my storyboard to pass by configuration for my SIP account. I include all Lib’s and h files in my build setting and it compile with no errors. My goal is to programmatically place a video call using Linphone. Does anyone have a sample Swift or Objective-C XCode 6 project or code snippet? Why “No such file or directory”? But I found iPhoneOS SDK 7.1 at /Applications/Xcode.app/Contents/Developer/Platforms/iPhoneOS.platform/Developer/SDKs I don’t know.Can you help me? I want to integrate Linphone version 2.1.2 in my iOS project. I tried everything but could not integrate it. There are so many files missing. Can you tell me the step by step process to integrate Linphone version 2.1.2 in my iOS project. Did you remember to update your IOS SDK? Just to thank you for following Linphone on IOS from the beginning. build quality backlinks , it will help you to increase traffic. Thanks you very much.You help me a lot! First, thanks for your this blog , but I follow your step can’t build the linphone lib , below is the error , can you help me ? Thanks . Same the result, not sure what’s the key problem . Have you tried do a “git pull” to get the latest or “git clone” to get a clean checkout and tried again? Another problem could be related with permission. So if all else failed, also try running as root. Do you know how to make your site mobile friendly? My site looks weird when viewing from my iphone. able to correct this issue. If you have any recommendations, please share. Now i have a project of 146 mb from which i can make calls ,do you know how to reduce the size further so that it will be successfully operating. Hi Suraj, I would suggest you to look into disabling modules you don’t need. You can do so via the “configure” command. But when i run the application i am seeing following errors anything i did mistake? Thanks in advance. I meet the same problem. Do you solve your problem? I just downloaded the code, and followed the instructions to compile. But when I tried to run in xcode, it shows a bunch of warnings of deprecations, and along with some other fatal errors. It seems I have cloned a very old version. The “news”file says it’s Version 2.0 and published in 2012….How can I download the latest version? After I chose the deployment target the deprecation warnings were gone. But the fatal errors are still there, it says /linphone-iphone/Classes/LinphoneManager.h:36:10: ‘linphone/linphone_tunnel.h’ file not found. I just built and ran it on another mac. Now I just need to figure out why the same code and procedure doesn’t work on my working mac. I saw there’s no error after the sdk build on the other mac, and as I said, there are some errors on my working mac. Jessica, can you please help take a look of the errors and figure out why these happened? Change permission of linphone source code.Your account may don’t have enough permission. libtool: definition of this LT_INIT comes from libtool 2.4. I have same issue please help. I followed your instruction down to the Step 7, but got the following error which I have no clue to fix it. Can you help me? Thank you very much. configure was trying to do when it died. Hi, I am trying to run following comment but it’s not working and giving error. Can you please let me know what can be an issue? You need to install “macports” first. It’s complaining about not being able to find the “port” command. When I am trying to run following command I am getting error as shown. Can you please suggest me what I am doing wrong? Warning: No index(es) found! Have you synced your source indexes? Is there any Guide like this you made for compiling Linphone for Android on MAC OS ? CAn you suggest me how i can configure it for iphone 5S and 6 ? seems it gets error when i compile for 5s or 6…. 1) Did you get errors while doing the make from the commandline? Or from XCode? 2) Have you downloaded iOS 8 SDK? and Set your SDK to 8 when compiling? 3) Did you do a “git pull” to get the latest source code before building? Yeah it compile without any errors. It got errors when i compile for iPhone 5s and 6 on simulator. Also, how i can include G729 Codecs ? Can you please post how to build for iPhone arm64 architecture. Did it give you an error? Hi,when I am trying to run following command I am getting error. I have installed MacPort.And when i run “su -” get “su: Sorry”. Jessica, can you please help take a look of the errors? Thank u for ur detailed post,i am able to compile it successfully and it is running on 32 bit devices, code is not getting compiled on 64 bit devices i.e, from iPhone 5s.I am not sure whether I’m missing anything or does Linphone still not supported for 64 bit device? ?Can u shed some light on my issue.Thanku. I am actually also trying to get it to compile for iphone5s and iphone6. Still have not had time to figure it out yet. Let me know if you figure it out please. So glad it worked out for you! I am trying for compile Linphone Source 2.1.2 on iOS 10.9 and Xcode 5.1.1. But i got the following error. Can you help me? builder-iphone-os.mk:105: *** mixed implicit and normal rules. Stop. Waiting for your help quickly. Sorry! I have installed Mac OS 10.9 on my PC. I have compiled it perfectly, after several try. But i am getting error (Apple MAsh O linker error) when building it for iphone 5s,6 simulator. In iphone 5 simulator it is working perfectly. What will be the issue ? I just got this resolved by forcing XCode to skip arm64 when building. Check the post again on how to do this. I want to customise the application, i want to know which is the method to make call in the project. So that i will call from my modified class,I tried a few all ending with user interface issue. Hi .. this tutorial is very helpful and worked perfectly for mountain lion but when i upgraded my mac with Maverick . I have successfully installed ports on Maverick 10.9.5 but only left with imageMagick port . How to install this on Maverick 10.9.5 . Please let me know . error: pathspec ‘configure.in’ did not match any file(s) known to git. I’ve updated the post since the latest linphone project has changed its build instruction a bit. Please try again. I would suggest that you do a clean git clone. I have a problem that if I selected the ZRTP type in setting page. Then I make a call the server said that I didn’t use the ZRTP in fact.Is there any thing else need to do to support ZRTP? thanks.. this is very good instruction. i spent a lot of time to compile the linphone SDK and then it works finally. However, when i open the project (either the .xcodeproj or the .xcworkspace), it always shows “ld: library not found for -lPods-KifTests-KIF” looks like the libPods-KifTests-KIF.a is not installed, I followed all instructions such as “sudo gem install cocoapods&& pod setup &&pod init && pod install”. Does any one know how to fix this? I searched online and did not find any helpful information. many thanks for your help again. Basically /usr/bin/install does not support -D option, hence install script generate this error. Once you fixed this issue, you can run make veryclean and make all. Hi, Please check 6th instruction?? Im stock on that for almost 4 days. Hi Jessica tutorial here ! I have follow this tutorial without problem and now I am encountering a problem with the make all, it says that I don’t have autogen.sh in /bin/sh. I’m in Yosemite 10.10 / xcode 6.2 /. Also i had to modify the build-iphone-os.mk because of “** mixed implicit and normal rules.” but it seems that i solved it. Thank you very much for writing this tutorial and answering all those questions. I also have a question. Following the instructions everything goes well till Xcode step 8. 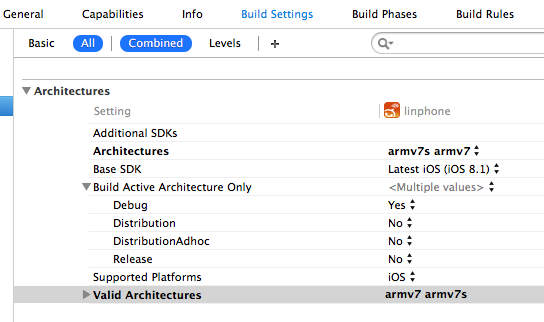 I checked http://lists.nongnu.org/archive/html/linphone-developers/2014-12/msg00076.html and http://stackoverflow.com/questions/22323039/arm64-architecture-in-xcode-5-1 but to no avail. and http://stackoverflow.com/questions/1456185/build-error-missing-required-architecture-i386-in-file and http://stackoverflow.com/questions/5544985/missing-required-architecture-i386-in-file but I’m not getting any further. If you could hint me to a solution it would be very appreciated. Problem solved. After installing Xcode 6.2 linking works as it should, although lipo -info reveals libXMLRPC.a is architecture: i386 so not multiarch. Strange ! Do you have any experience implementing this library on Android as well? If so, would you or would you know someone that would be interested in contract work to develop an app for the Android and iOS platform utilizing linphone? I do but I just started at my new job so may not have time to take this on. But I would love to ask around for you. Why don’t you send a link about this project to my gmail jessica.w.chiang@gmail.com? I finally was able to compile the sdk on my new computer. Maybe because Linphone updated their project. Anyway, it now compiles by following only their READ.md at the top level or their instruction on github: https://github.com/BelledonneCommunications/linphone-iphone. There is no need to build liblinphone first. My system has: MacOS 10.10.3, Xcode 6.3.1, iOS 8.3, and the latest linphone code as of yesterday. Thanks, and hope the info can help you update your great tutorial. It seems that somehow you are trying to execute a directory, instead of an executable file. Have you tried checking out a new linphone source copy and follow the tutorial again? Is it something with my env vars or any other idea? You ought to be a part of a contest for one of the greatest blogs online. but that is also not working. What should I do now to resolve this Issue. blizzard store How to Buy Wow items fast and safe at raiditem. You can grab World of warcraft items such as wow mounts, wow gems,blizzard store, wow weapon, wow armor and so on. The safe and fast delivery awaits you! You will enjoy a great customer service! I have downloaded the linphone SDK and try to write a demo with the latest SDK. Could you help me to take a look. What’s mean when linphone status = 4, message=”io error”. Did you get this while running the app? a comment is added I get 4 emails wiith the same comment. Estamos listos para la reparacion de sus electrodomesticos en Madrid y alrededores el mismo dia de la solicitud. to senhd me an e-mail. Los Palladium Hotels & Resorts le ofrecen todas las facilidades y servicios para hacer de su estancia un recuerdo inmejorable: servicio de recepción 24 horas, servicio de teléfono y fax, conexión ADSL con cargo, TV por satélite, consigna para equipaje, servicio despertador, cambio de moneda, servicio de lavandería, parking exterior, rampas de acceso para minusválidos en las zonas comunes y piscinas , máquinas de refrescos, máquina de hielo, entre otros. added I recieve 4 emails with the same comment. You should ake prt in a contest for one of the most useful websites online. Yes! Finally someone writes about rencontre amicale stt brieuc. Multinacional requiere personal técnico en Soldadura para la ciudad de Medellín, mediante contrato de prestación de servicios, interesados enviar hoja de vida con soportes. Asegúrese de que cada página de su web tiene una meta descripción única, y que ésta sea explícita y contiene sus palabras clave más relevantes (aparecen en negrita cuando coinciden con la consulta del usuario). Keep on the process. Now, available the other hop ring just like anyone opened up the very first. Get your current 3 rd hop ring as well as hyperlink that to the second. Shut that soon after. Carry out the ditto to the other hop bands in anticipation of having shaped the actual bracelets to your preferred duration. Measure your own wrist. Utilize the flexible necklaces twine to ascertain the height and width of your own wrist by adding that close to your own wrist. Include two inches to the way of measuring to ascertain the amount of your own view group and also to provide place with regard to considerations. Hello I am getting this error and unable to proceed. Decide the level of feather boa that you might want. Possess a photo in mind in the best feather boa. It should be massive and for a specified duration to your outfit. Remember to contemplate your dressthe feather boa should go perfectly with it. Take note the number of ovoids you utilize as well as the number of times you repeat this process would likely nevertheless depend upon the length of your watch band as well as on the size of your own ovoids. If the ovoids are incredibly tiny, you’ll require more than 58 bits. If the ovoids are incredibly huge, you could possibly may make apply 60 bits. really recognise what you are talking about! Trainer is a number one National designer plus a creator of high end lifestyle footwears along with accessories. In case you are someone that really like the project of Trainer you can travel to their shops nearby a person. I discovered many significant things by your submit. I may like to state that there might be a predicament that you may make application for a loan and never need a cosigner such as a Government College student Assist Loan. But if you are receiving any asking for agreement through a standard financial institution you will want to make ready to use a cosigner ready to make it simpler in your case. Lenders are going to starting just about any choice over a few concerns nevertheless the primary you’ll be your credit history. There are many creditors that can moreover take a look at task background and make up your mind according to this particular but in most cases it’ll pivot on your standing. Losing manage is becoming my finest blessing. Warm selflessly, thinking thoughtlessly, hoping fiercely, as well as experiencing amorously the wonder associated with my loved ones. This is just what parenthood is becoming for me and its only inside sacrificing manage that we may pleasant the rest of playing, a single normally well-organized as well as exceedingly well adored visit to a period. seize your RSS feed to keep up to date with forthcoming post. stylish. nonetheless, you command get got an nervousness over that you wish be delivering the following. Linphone from Source for iPhone and iPad | Shall We Learn <Loved it!